All of our Precast Concrete Stairs and landing units are designed in accordance with relevant BS and Euro codes. Concrete Staircores have a number of benefits and excellent sound absorption properties are one of them which is why precast stairs are widely used in homes and commercial properties alike. Precast concrete staircores provide a durable & attractive product that can be used for any building type. The speed and ease of with which precast concrete stairs can be installed in projects provide the contractor with a time-saving product. 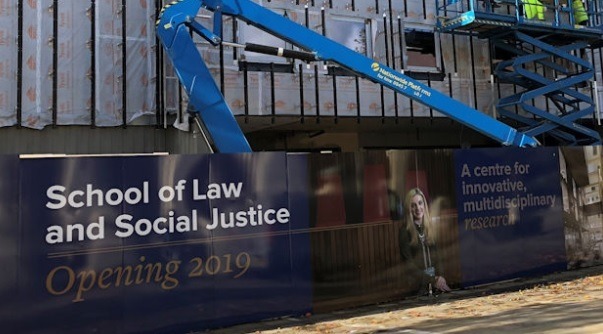 The overall construction period for the new School of Law and Social Justice will take 22 months to complete, with the handover of the existing refurbishment building planned for September 2019. This will be followed by the new build extension at the end of the year where Flood Precast will provide 22no Precast Stairs. Enabling works commenced in January 2018 with the main construction works started in March 2018, Flood Precast final delivery to date was December 2018.